One of the most common questions I'm asked about our three months of traveling Europe is what places were our favorites. After making our way through France, Switzerland and Italy, which destinations were most memorable? Where would we return in a heartbeat? I generally don't like choosing favorites - and we pretty much loved everywhere we went! - but here are the five places that first come to mind when we're remembering the best of the best. I think it would take some concerted effort to not enjoy this place. We stayed in Positano - the most popular town - in August - the busiest time of year - and still loved every minute. There are plenty of fancy hotels and restaurants around, but the best things about the Amalfi Coast are the simplest: riding ferry boats from town to town, taking in the mythical landscape everywhere you go, swimming for hours in the clear blue water. Our best day trips from Positano were to glamorous Capri and the hilltop town of Ravello, and we can’t wait to return someday with friends! A trip to Loire Valley is like stepping inside a classic Disney princess movie. Surrounded by castles and lush landscapes, you never know when you might find yourself in a pretty garden with helpful woodland creatures gathering around. We spent three days exploring châteaux and sampling the local wine, and made our visit even more magical with a hot air balloon ride over Château de Chenonceau. It’s a perfect long-weekend escape that’s not too far from Paris. There's so much to see on the Côte d'Azur that we easily could have spent a month hopping from place to place along the coastline. With two weeks to explore, we based ourselves in Nice aa many day trips as we could. Some of our favorite spots were Cannes & Île Saint Honorat, Èze Village, and Monaco. For a return trip, Villa Ephrussi on Saint-Jean-Cap-Ferrat and Hyères & Île de Porquerolles would be top of our list. Switzerland wasn't originally on our itinerary, but it turned out to be one of our favorite places of the summer. The landscape in Interlaken is incredibly beautiful and our visit was simultaneously peaceful, full of things to do, and remarkably easy to enjoy. The buildings, the food and even the tourist experiences are up to the Swiss standard of excellence. One thing we missed out on was paragliding - we would love to plan that for a return trip, along with visits to Geneva and Lucerne. 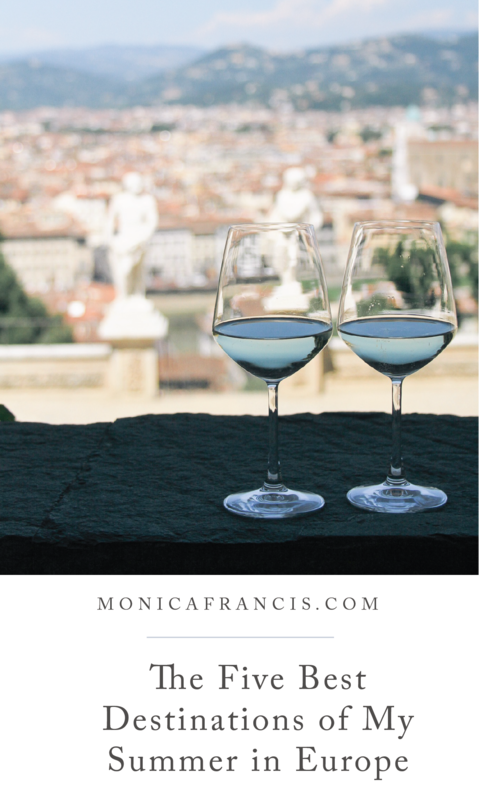 Florence makes it easy to live an idyllic Tuscan life, even if only for a few days. The city itself is wonderfully friendly and walkable, full of fantastic art and food at every turn. Because it's home to so many foreign students and transplants, you'll find plenty of variety in languages and cuisines, and a generally friendly attitude from almost everyone you meet. From Florence, we explored a bit of Tuscany - Chianti, San Gimignano, Siena - and made out way past Pisa to Cinque Terre.